I bet RS doesn't have one, either. I have a Crystal Palace calendar. I honestly find it odd that people still buy calendars. They are on everyone's phones, tablets & computers so why the need for another one? I think it would make more sense for The Cure to sell an app that adds release dates for records & concert dates etc. yes collector things only for me ......i know . I put mine up but I don't use it as a calendar really; just like a picture on the wall. I use it all the time every day. Hmmm... seems like a good time of the year to mix up things for a while. What about to start with 'Just One Kiss' and then move on to 'The Caterpillar'? Or The Lovecats/Happy The Man ? I've had to turn it back a month - can't be doing with the smug/WMS crossover for October. 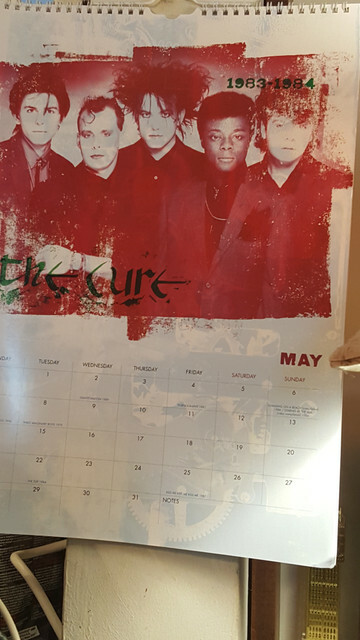 It's funny you say that, because I was looking at the October page this morning in the hall and thinking that look, for me, epitomizes the transition from when they look like babies to them looking like disgruntled, jaded middle-agers. "Hello, kettle, this is the pot speaking." Sorry if this was posted already. New products like CURE calendar 2019, tees, hats and more on CURE store. Some products fill my eye! Because I wouldn't be a good 'Merican if I didn't consume goods the day after Thanksgiving, I got two t-shirts (RS Blue and Black Forest) and a calendar. I *Wish* (jinx!) there was some kind of size chart for the women's cut shirts, but I will take my chances. Nice to have good mail to look forward to.